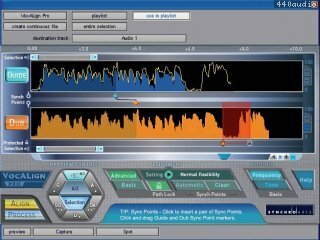 Synchro Arts introduces VocALign PRO, a new and more powerful version of the unique VocALign automatic audio alignment tool. VocALign PRO provides audio, post production, and multimedia professionals the greatest flexibility and power to quickly complete audio alignment tasks — automatically, within the Pro Tools® environment as an AudioSuite plug-in. VocALign PRO automatically stretches or compresses one audio signal to match the timing patterns of another, saving you time and money. VocALign PRO introduces advanced new features that offer improved accuracy, sound quality, and ease of use. New preview controls allow you to listen to sections or all of the signals before and after alignment, individually or together. User-defined Sync Points let you target audio alignment at specified pairs of points in two signals. A protected signal block feature allows you to protect sections of the replacement (or Dub) signal from being time-compressed or expanded during alignment. VocALign PRO also provides a longer maximum signal length, enabling you to process up to five minutes of audio at a time. No matter how much audio you process, a new, more sophisticated pattern recognition algorithm increases alignment accuracy. Whether you need to synchronize dialog to video, dub foreign language films, tighten Foley and sound effects tracks, align double-tracked vocal or instrument parts, synchronize a drum machine to a real drummer's performance, or achieve a perfectly lip-synched performance for a music video, VocALign PRO gives you a fast, easy way to get the job done. Synchro Arts VocALign PRO is available through Authorized Digidesign Resellers and the online DigiStore. VocALign Project 3 and VocALign Pro 4 are now available as AAX plug-ins. They are designed to work with Pro Tools 11 and later. They will not work with Pro Tool 10. They are available for Windows and OS X and support the same operating system versions as Pro Tools 11. The look and function of the plug-in is nearly identical to the earlier Audio Suite plug-ins which work on Pro Tools 10 and earlier and so the same operating manuals and tutorials can be used. The AAX plug-ins use the same licences as other plug-in versions of VocALign Project 3 and Pro 4 so current owners of the iLok licences for these products can use the AAX versions at no extra cost. You must have an VocALign Project 3 or Pro 4 iLok license to use the beta plug-ins. 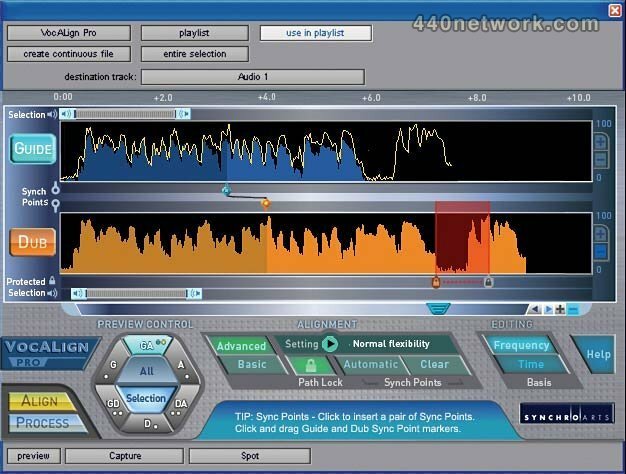 There is an issue in the current versions of Pro Tool 11 which can result in the length of the output audio created by VocALign being too long. The signal will be followed by an area of silence.